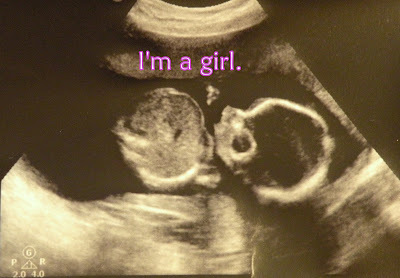 So...again...still no blogging, but at least a snapshot update. Today this little girl started preschool 2 days a week. She could lead a class on scholastic enthusiasm. And in 13 weeks little girl #3 will be here and there will be lots of coordinating outfits. There are times as a parent, where the kid inside of you floats to the surface. My "kid" moment started Thursday when a friend said we should come see her ducks. Immediately I thought, sure, kids love feeding the ducks outside...What she actually meant was, "You should come see and play with out 2 live pet ducklings living in our house!" I started feeling "kid-ish." It was love at first site for my girls when they laid eyes on 2 baby ducklings. I knew my oldest would be an instant fan. From as early as I can remember, "animal lover" would easily describe Aislynn. As a toddler, Aislynn took great offense to a baby crying while being side tackled by a dog was perfectly acceptable. My youngest falls at the other end of the spectrum. "Suspicious of animals" would easily be in her character description. She would much rather try to sooth a crying baby than have even the tiniest puppy run at her let alone attempt to side tackle her. The wheels started turning after I found out that Rural King sold ducklings in sets for $3.99. Who can resist an adorable, cheap, and TEMPORARY pet with such an easy exit strategy? Seriously, they swim away. Immediately, a childhood of temporary pets flashed through my mind: Our third grade zoo: Mice, newts, and a tarantula...hatching chicks and taking one home..,my next door neighbor ending up with kittens in his garage...guinea pig babies...And so I thought, we'll just go to Rural King on Friday to check out the situation. We went to Rural King on Friday. 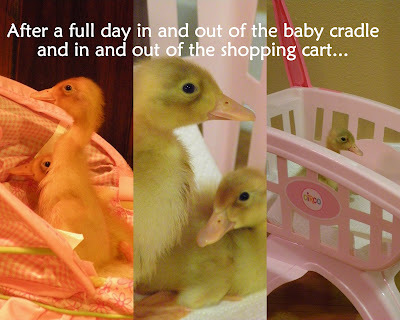 We checked out the situation so thoroughly, that we left with 2 ducklings, some feed, and a heat lamp. My tiny entourage, in addition to myself was excited. We decided to surprise Daddy, and thought all our excitement would definitely rub off on him. I have been known as an "animal surpriser" at times. Surprise Mom! I bought my sister a guinea pig, Surprise Mom! I bought 2 guinea pigs! Can you take care of them while I student teach?....Surprise roommate, I brought a kitten home for us to find a home...Usually these surprises did not quite elicit the enthusiasm I was hoping for at the time. Perhaps I have a need to surprise everyone after my childhood longing to be surprised with a puppy under the Christmas tree in a box with a red bow on it went unfilled. A void which I am more than happy to KEEP void now (no puppies right now please for all you who were planning on mailing me one). After being married to me for almost 6 years, my ability to shock and surprise Andy with my adventurous side has dulled a bit. In other words, I think it would take quite a lot for Andy to be surprised by me. I am so full of surprises, I think he expects it. Andy came home for a quick lunch break to the greeting, "Daddy! We have a surprise for you!" The girls unveiled our newest house guests and Andy of course remained a good sport. As long as the ducklings do not escape in the house, poop on anything, and eventually-sooner rather than later-swim away, I think he will be fine. My master plan: Care for our new friends indoors for a few weeks. Then, as the weather warms, and they grow into tweens, let them outside in the backyard, then eventually take them to a duck pond and let them go. The girls already know that when our babies grow bigger, we'll take them to the pond to, "swim away and find new friends," as they like to put it. Needless to say, on this first day home, our newest families members had quite an eventful day...probably more eventful than their Rural King days. 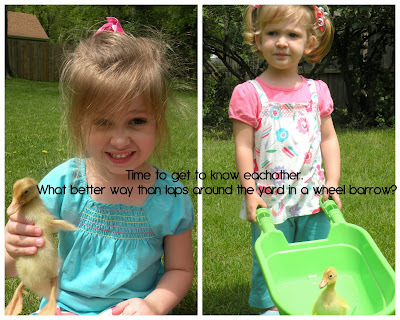 Being the cruel mother that I am, I told the girls they could not hold the ducklings until their toys were picked up. They opted to sit and stare longingly at the ducks for awhile before beginning, what appeared to be a painful process, of picking up toys. Meet "Sam," (Aislynn's) and "Ming Ming," (Isla's). 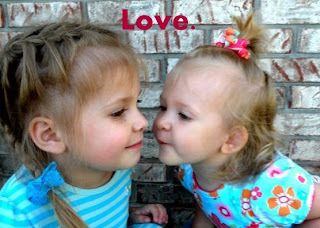 Aislynn wanted to name them "Pam" and "Sam," but being a gracious older sister, allowed Isla to name her own duckling. 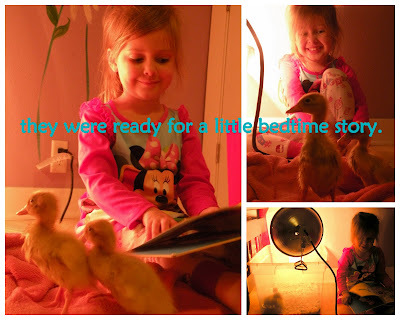 Aislynn read them a book, sang them a song, and put them to bed. Rest up little duckies! You'll need it for tomorrow. Perhaps our new friends will fly away sooner rather than later after a week with us! Over 3 months ago I lived in Bloomington Indiana as a renter. I now live 4 hours north as a homeowner. Definitely a BIG change for our family. I miss Bloomington and all the amazing people living there. Even though we lived there for one short year, I'd like to think we made some lifelong friends and forever memories. In my mind, Bloomington feels like a summer home from the movies, where the people in the movie all live in summer cottages. They live a different life with new friends all up at the lake and they all have a blast, but at the end of the summer they all go back to other lives. It was a short visit in Bloomington in the whole scheme of the timeline of life. I may not own a summer home, but don't worry B-town, I'll be back for a visit. I feel like ever place we live as a family, turns out to be the perfect place for us at that exact stage we are at in life. It doesn't mean everything is ideal about the place or the circumstances, but it meets our needs as a family. In each of these places, I always meet a few forever friends, and a whole bunch of friends for that stage in life. These are people that influence my life for the better, and make me happy. Amazing people, you know who you are. Thanks for rocking my life. Right now we are on to the next place, actually an old place at a new phase in life. I never dreamed I'd be back in my old college stomping grounds. But here we are. Its strange to have so many memories as a 19, 20, 21 year old, and now be making memories here as a wife and mother. Its familiar and unfamiliar all at once. In processing living in my familiar and unfamiliar surroundings, I find myself thankful. "The college years" stir up so many memories good and bad. Its great to remember all the hilarious things from college and even to reconnect with old friends from back then now as couples and families and moms. I am loving this! I am thankful for the college years that introduced me to my future husband. We never dated in college, but that's where it all began-the friendship, meeting, the groundwork. But not all the memories are good ones. Being in a familiar place makes you remember all kinds of things, and some things aren't so great. I have a pile of those kind of memories as well: Broken relationships, bad choices, hard times, growing points. I am so thankful to see the bigger picture. Now 9 years later I see that the broken relationships ended, and opened up space for new exciting life long ones. I see that bad choices don't always control your life and can teach you important lessons about who you are as a person. I see that hard times and growing points are a part of life. I understand what healing, forgiveness, and living a life of integrity mean. I see that when it felt like things were uncertain, confusing, and stressful for a 20 year old girl, they ended up certain, clear, and pretty great with a husband and children I love more than anything I loved as a 20 year old girl. 3 months ago I never dreamed I would have a beautiful home with a fenced in backyard surrounded by friends and family. And I definitely never dreamed my best friend and some other pretty amazing friends would be our 60 sec away and 45 sec away neighbors within weeks of our move. Life feels crazy, unpredictable, and awesome sometimes. A year and a half ago we were in quite a different place. Unemployment, uncertainty, and unknown described our situation. I don't think we dreamed a year and a half down the road we would be here. But if I look back, I can see things a bit more clearly. Life doesn't always make sense, even in retrospect when you have more answers, but sometimes things seem a whole lot more clear. I'm glad our journey brought us here. Its amazing what happens in 3 months. And that's just the beginning.